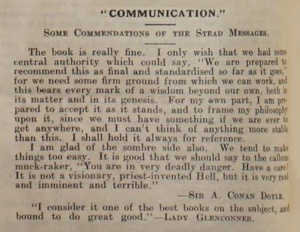 Communication is a letter written by Arthur Conan Doyle first published in Light on 24 september 1921. Some Commendations of the Stead Messages. The book is really fine. I only wish that we had some central authority which could say, "We are prepared to recommend this as final and standardised so far as it goes," for we need some firm ground from which we can work, and this bears every mark of a wisdom beyond our own, both in its matter and in its genesis. For my own part, I am prepared to accept it as it stands, and to frame my philosophy upon it, since we must have something if we are ever to get anywhere, and I can't think of anything more stable than this. I shall hold it always for reference. I am glad of the sombre side also. We tend to make things too easy. It is good that we should say to the callous muck-raker, "You are in very deadly danger. Have a care! It is not a visionary, priest-invented Hell, but it is very real and imminent and terrible." This page was last edited on 19 July 2016, at 13:42.